Mobile Market has grown at a rapid speed in past few years and with the advent of big players like Apple, Google and Microsoft with their different OS, we have been hooked to use smartphones more than PC these days. As the use of smartphones has increased, so has increased the use of apps on these phones. Be it seeing the current weather or planning a trip or ordering a Pizza, life has become much easier with the use of apps on phones. With the rise of usage of apps, creating mobile apps has been one of the most profitable businesses in the world from past few years and people are making money by building apps. 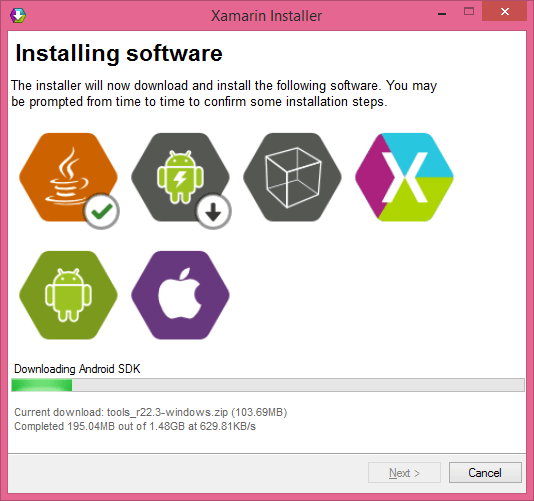 The 1st step to start is to download Xamarin from http://xamarin.com/download . Once you have filled in the form and go to the Thanks page, a downloader is already being downloaded on your PC. 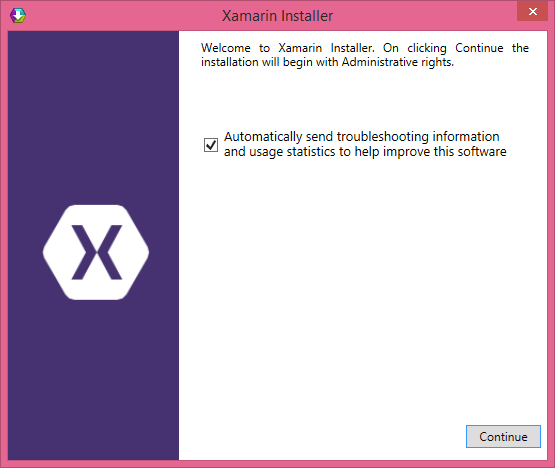 Double click the XamarinInstaller.exe file and the setup will start on the computer. Click Continue on the 1st screen to start the installation. If you don’t want to send Troubleshooting information to Xamarin, you can uncheck the checkbox else proceed with the installation by hitting the “Continue” button. 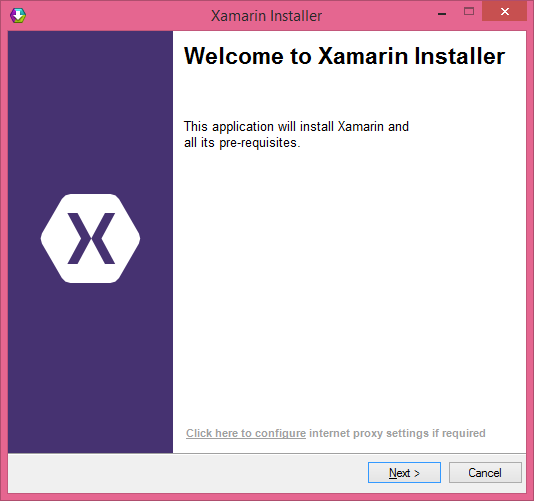 Click “Next” on the Welcome screen of Xamarin Installer. 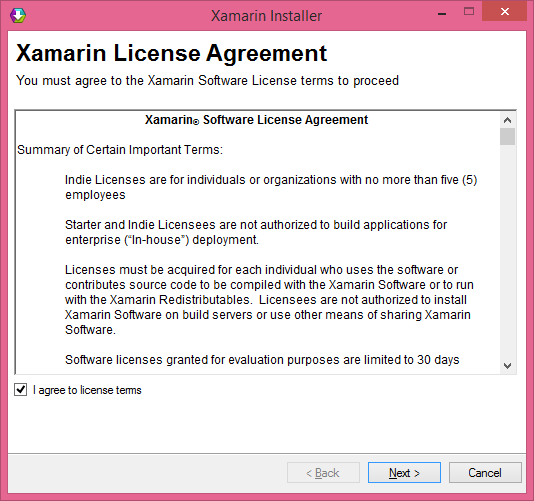 Agree to Xamarin License Agreement & Terms and click “Next”. Select the Products that you want to install. If you want to install only Android version, you can just check “Xamarin.Android” or if you want only iOS version, you can check “Xamarin.iOS”. If you want both version, just leave them checked and click “Next”. Click “Next” on the next screen. 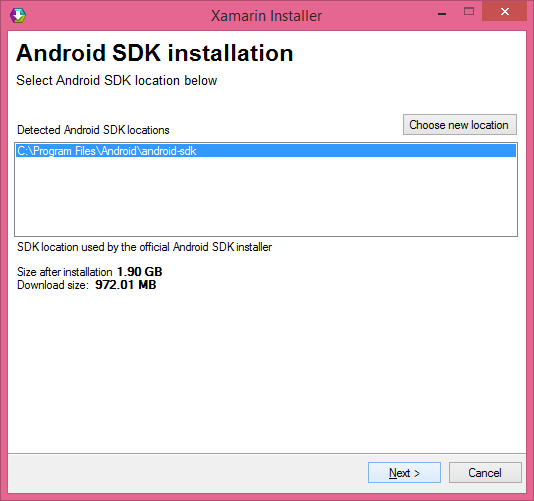 In case you want to select a new location for Android SDK installation, you can choose the same by clicking “Choose New Location”. Once the new location has been selected, click “Next”. 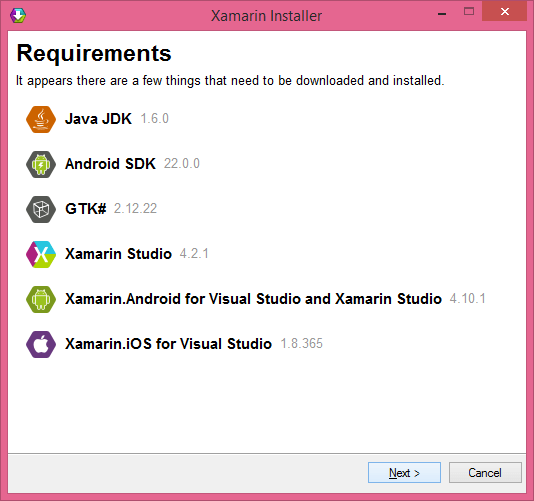 Based on your system, the Xamarin installer will find out the items that need to be installed on your computer and will let you know the same. Also, it will list out all the items that will be downloaded & installed by the installer. Click “Next” on this screen. 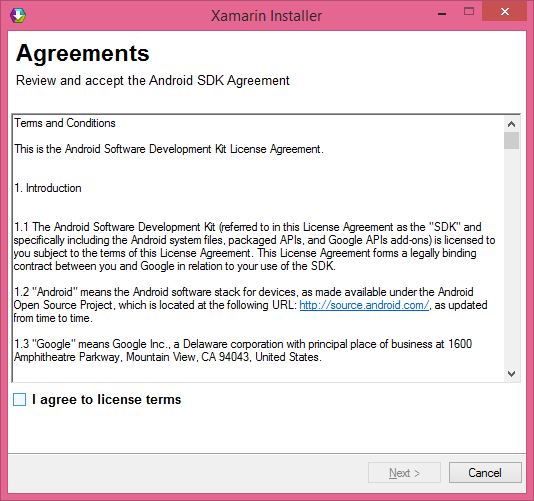 Accept the Android SDK agreement and click “Next”. The next screen will show you the current status of the installation. The software will automatically download all components over Internet and install it one by one on your computer. The interesting part of the installation is you actually have a Graphical representation of what has been downloaded, what is being downloaded right now and what are items that re remaining. For ex -, if you see screenshot below you will notice Java SDK has been downloaded & installed successfully on the computer and currently Android SDK is being downloaded. Once all the components are installed, click “Close”. 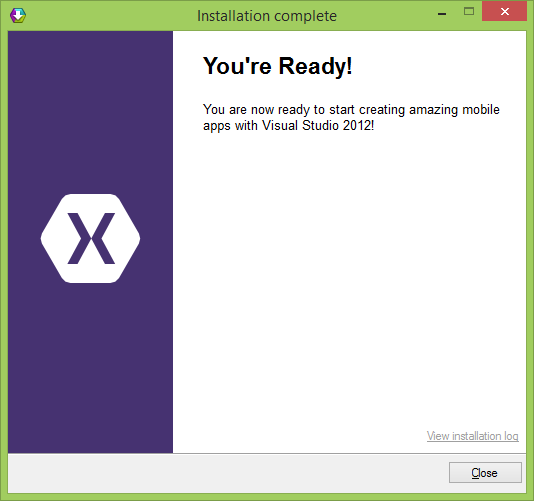 Once the software is installed, you can start building apps using Xamarin Studio or Visual Studio. 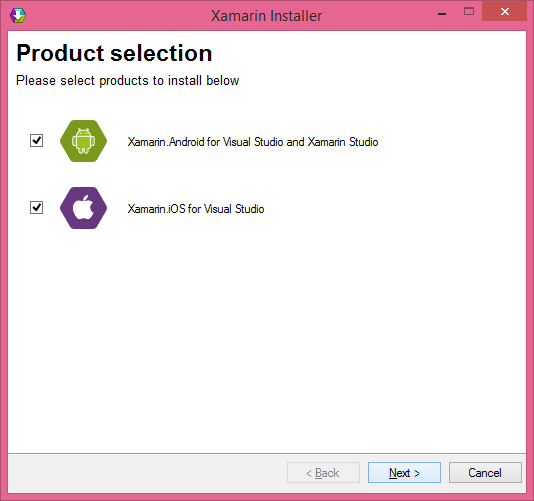 To start using Xamarin in Visual Studio you either need Business edition or can start a free trial of the same.